Barter Books in Alnwick Station, Northumberland looks like the kind of place I could lose myself for hours, days even. It is a secondhand bookshop that looks like so much more than just a bookstore. It’s a destination with wifi, a restaurant/cafe, fireplaces, and big comfy chairs. Heaven. If you’ve been, please tell me about it—I’d love to visit one day if it’s fabulous as it looks. It was my avatar on Basecamp (a workflow system) at work for a good long while and seeing it every time I logged in worked wonders for me when the workload was extremely heavy and the pace was hectic. It reminded me that others were watching. You’ve heard the phrase “fake it ’til you make it”. There’s a bit of that in here. 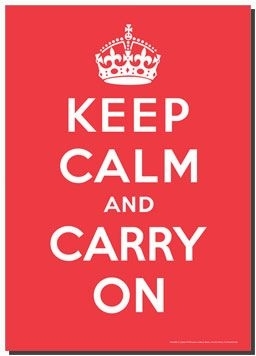 By keeping calm and carrying on, you don’t have to say a thing. By just doing what needs to be done, you calm yourself down, you give yourself purpose. And when others see how you are reacting, they realize that maybe it’s ok to do what needs to be done too. But most of all, it gives you focus. And breathing room to think while you do. I’m certainly not suggesting that you lie on your back in the face of adversity or challenge. You should know me well enough by now that I’m not passive. And I’m opinionated. But there’s something to be said for collecting your thoughts, pulling yourself up by the bootstraps, putting nose to the grindstone, and moving forward positively, verses wasting energy getting angry and not completing what needs to be done. There seems to be a lot of that in the world right now and maybe if we all just calmed down, things would be better. 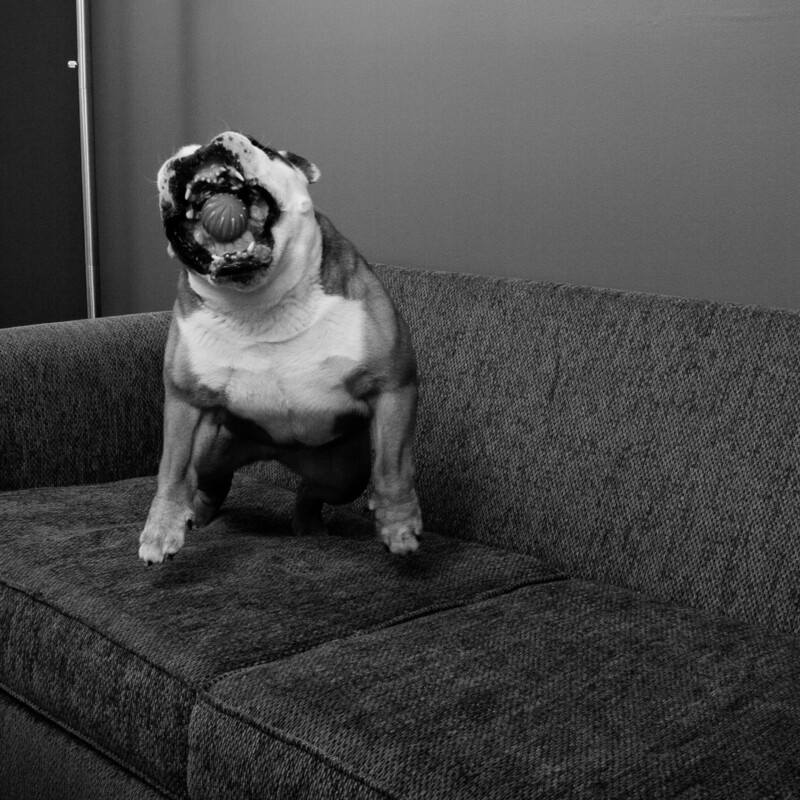 Anyway, after yesterday’s beastly rant, even with the gratuitous bulldog photos*, I wrote this post to remind myself that my silly first world problems need to be addressed as such. And I am, as Fransi reminded me, I was overly tired and that made Monday worse. Still tired, but Tuesday was significantly better. But tonight is a “bye” from the DIY. We are focused on keeping Guinness calm so he can carry on tomorrow and feel a lot better than he has. 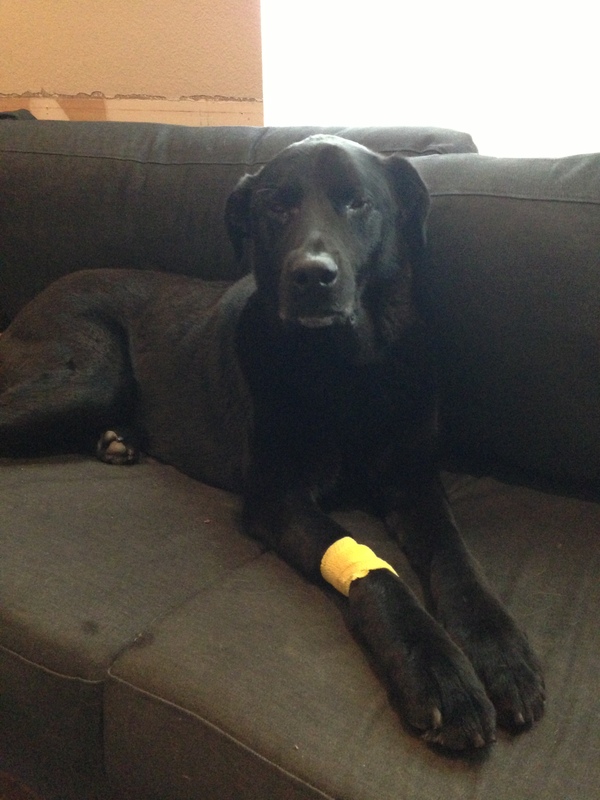 Guinness is a great, but seriously dopey patient. He is spending the evening bonding with the sofa and so are we. Guinness is doing great. His fractured and abscessed tooth was pulled and the rest of his teeth were cleaned. I’m not poking in his mouth tonight, but I bet his smile is dazzling. His skin tag by his eye has been removed via cauterization so he may not have to wear the comfy Cone of Shame after all. Apparently a thorough pedicure was our free gift with purchase—definitely a bonus for a black dog with black nails. He’ll also have to eat soft food which as you might guess will be such a hardship. He ate an entire packet tonight no problem. I only hope we can ween Guinness back to his usual mostly dry stuff with a touch of wet!. 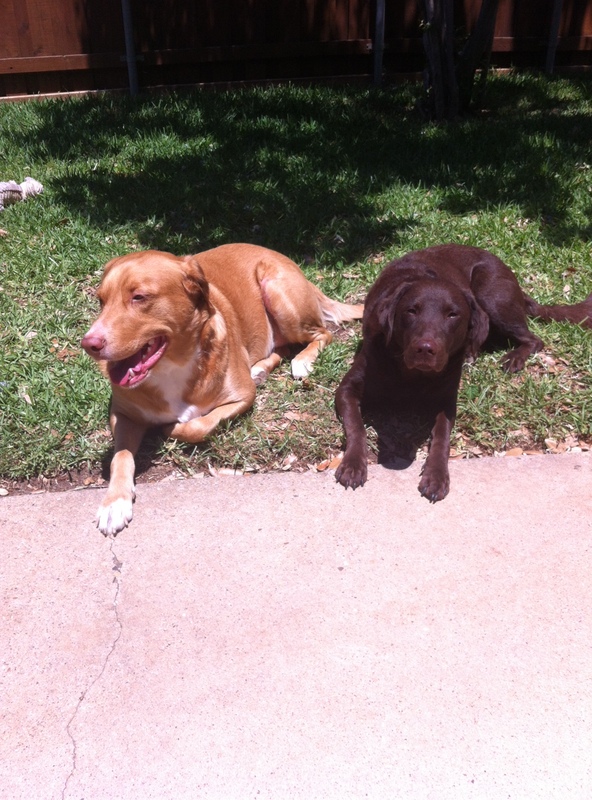 Godiva and George each reacted to Guinness’ leaving for the vet this morning in different ways. Godiva got mopey as expected and refused to hang out with me while I watered the veggies. When Guinness and Bruce were leaving for the vet, George tried to squeeze out the door, just like he did when I took Guinness to the vet last week. He stood at the window and watched Bruce’s truck roll out, but unlike Godiva, I think George just wanted to go wherever Guinness was going! There were lots of sniffs all around when Guinness came home, especially Godiva. Both George and Godiva are extra tired tonight, as if they stayed up all day patrolling, waiting for Guinness’ return. *Yes, Daisy was ours. 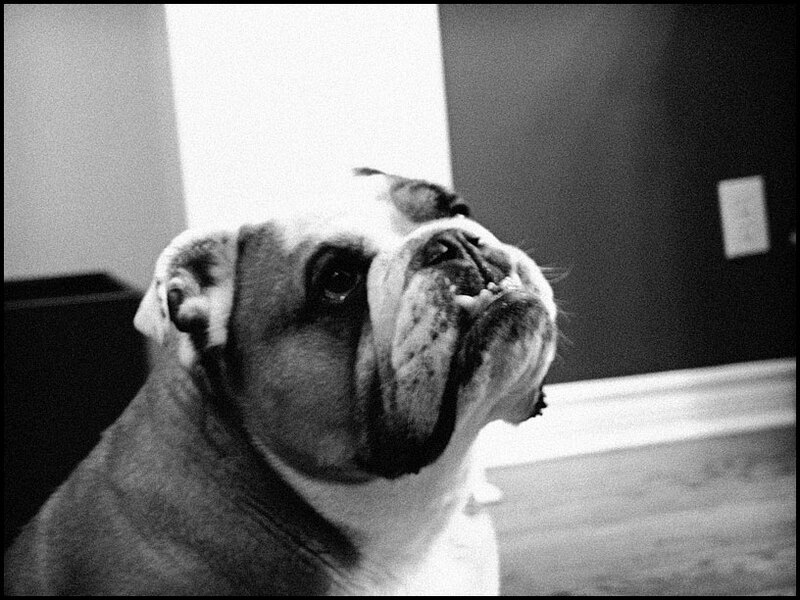 That bulldog was the first dog Bruce and I had together and came into our lives when she was 8 weeks old. We lost her nearly 4 years ago and a month later we got Godiva.